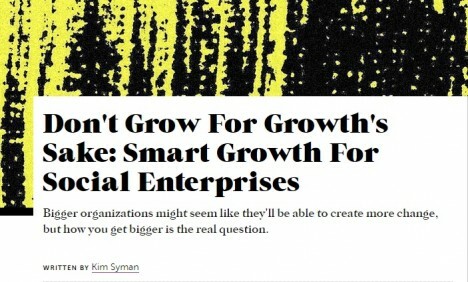 This morning, Fast Company Co.Exist ran my op-ed "Don't Grow For Growth's Sake: Smart Growth For Social Enterprises"
"How small can I stay, while still driving big, transformative impact?” It’s a provocative question that more and more social entrepreneurs are addressing, and is the main focus of this piece. Highlighting Health Leads, a New Profit partner and grantee, I discuss how creative leaders are approaching impact in new ways and opening up big new possibilities as a result. This is the second installment of a larger series: "7 Reasons for Social Innovation Optimism." Click here to read more about "'smart growth'--the use of new design frameworks, access to data, and technology to create bigger, faster pathways to scale."